The idea of making a paper flower for the gift wrap came from Danny Seo that made very cool curly magazine ribbons a while back. I think this is a great idea, because I love making gifts but don’t like to spend money on expensive stuff that will be torn of and thrown away within minutes after they’ve been received! DIY girls! 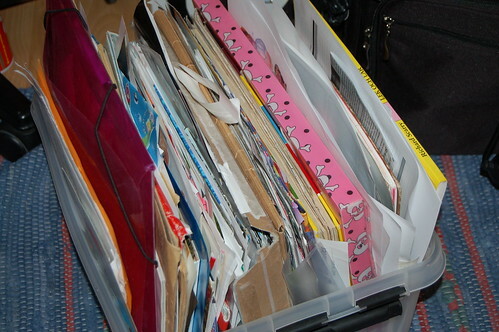 Some of my collage papers in a neat plastic bin beside my bed. I try to use this stuff to make it less, but I think my piles of papers, magazines and ephemera is growing when I sleep. It’s expanding all the time! This entry was posted in Paper Crafting and tagged celebrating, gift giving, prompt, recycling, thrifted finds. Bookmark the permalink. I’ll bet your mom was over the moon about your lovely book! And these cats are amazing – It’s so crazy how they’re chained together with that delicate gold chain. Plus – green noses! I’m so glad you gave them a good home. They’re awesome. Happy birthday to your mom! *^v^* The colours on the kitties are just perfect! (for me, anyway), although porcelain is not my cup of tea, I’m always scared with any figurines and I’m very careful not to break them. Cute, though! Happy Birthday to your Mother. It’s my mom’s birthday too! How wonderful! I love the magazine flower! How did you do it? Happy Birthday Mom!!! Isn’t it great that we can still give our Mom’s treasures that we make! The child within us must never be silenced! 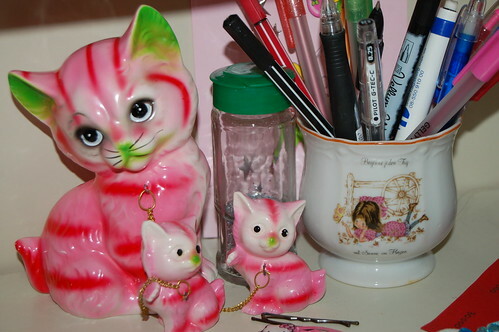 :) The pink kitties are cute..pink..but cute! I am trying to make friends with pink! I really am! I like weird oddities like collecting Pez dispensers and Scooby Doo’s and Penquins! LOL What can I say! hee hee! Much love! Yes, she was a bit crazy, bragging about to everyone and showing it until I was embaressed. She loves it! 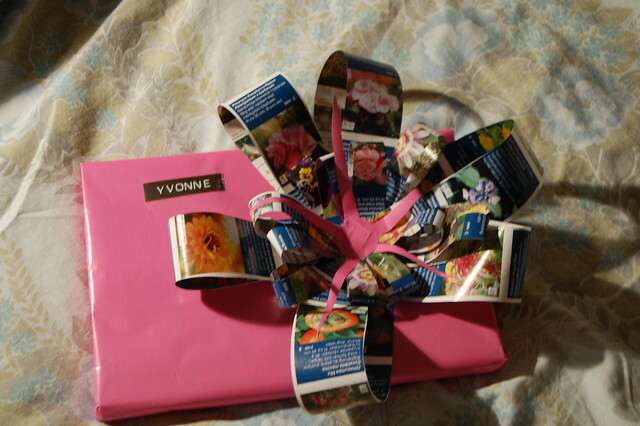 I made the flower by cutting strips of paper from a magazine and then stapling them together with a stapler in the middle while folding the stripes. They became kind of a flower, and it was very easy! Pink is good, just tell yourself that! Great paper flower and EXCELLENT kitties! i agree, sure to make you smile! Your mom is so blessed because it’s not everyday that mothers get to receive books written by their own children. i just took a sweet little stroll through your blog; loving your sock monkeys, journal pages, your tidy box of collage papers, and magazine ribbon on your lovely gift to your mother. i’m sure she is tickled pink and so proud of you! I just found your blog via WhipUp. Love it. I also want your book, as a gift to myself!